Quadio designs and creates hearing experiences just the way you want: Hear what you want, when you want and how you want, anywhere, anytime, with the assurance of the best customer care. Hear better today. Leveraging the power of internet, electronics and audiology technologies for a portable diagnostic solution. Easy conversations, clear audio, customized listening. With inbuilt hearing tests, adaptive sound processing, versatile fine-tuning. Know more here. Brand new hearing aid offering. Rechargeable battery, bluetooth compatibility, customizable via app/presets, ready to use out of the box. Quadio designs and builds diverse products to address the gamut of hearing solutions. 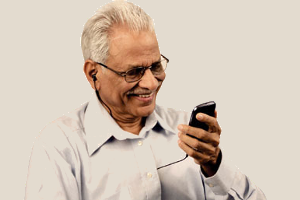 From specialized hearing aids to mobile apps and diagnostics equipment, we use technology to provide accessible, affordable and quality hearing care to the people of India. Quadio delivers a range of binaural (both ears), progressive, easy-to-use, personalized and programmable hearing aids featuring long-lasting rechargeable batteries, bluetooth compatibility and app-based customizations. 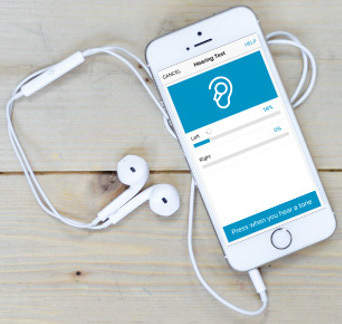 Leveraging the latest electronics, signal processing, communications and mobile technology for designing accessible adaptable hearing solutions, the company has built a futuristic mobile app hearing solution and highly-advanced portable audiometers. 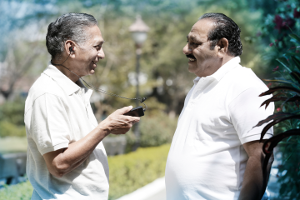 A leading-edge diagnostics solution, Net Dispensing is pioneering audiology technology delivering the entire spectrum of hearing health services online, from hearing evaluation to hearing aid fitting, to patients anywhere, anytime all across India. Net Dispensing is a comprehensive solution that begins with diagnostics (Net Audiometry) and completes with hearing aid fine-tuning (Remote Fitting), without the necessity of an audiologist to be in front of the patient. All audiometry functions – hearing health evaluation, counselling, hearing management and hearing aid fitting – are performed seamlessly over the internet. Net Dispensing is affordable, breakthrough, all-inclusive and reliable, allowing audiologists to eschew the need for establishing costly infrastructure but dramatically increasing their patient reach, delivering an innovative solution for low penetration of hearing health services in India. Hearing health centers staffed by highly-qualified audiology and care giver personnel, Quadio hearing clinics provide a perfect fine-tuned solution and peerless customer service in a comfortable environment. At Quadio hearing clinics, we want to give you the Quadio Experience. We personalize your hearing care through a multistep process which helps us get to know more about your hearing health and requirements to provide a hearing solution that fits perfectly with your lifestyle. Quadio's mobile hearing clinics home visit model bring hearing health right to you. Fitted equipped with Quadio's state-of-the-art Net Dispensing technology, our care givers bring quality health care services to your home. Quadio is a socially-responsible company spearheading social initiatives to bring inclusive, affordable and quality hearing health to people in rural area. Quadio aims to bridge the gap between the need for professional hearing health care and the lack of availability of such services by organizing mobile clinics and hearing camps. These clinics are equipped with the innovative Net Dispensing technology to provide free hearing counselling and guide patients about possible options to manage their hearing impairment. Click above for an overview about hearing loss, the typical causes and recommended treatment path. 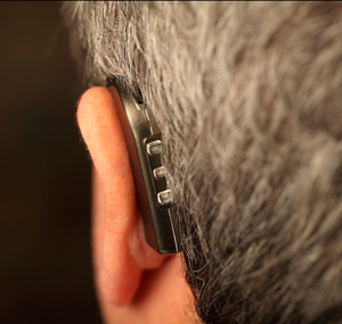 Click above to take a questionnaire to check if you may be experiencing hearing loss symptoms.